Two weeks ago we announced that the Cockleshell Endeavour is back and that Mick Dawson and Steven Grenham will be kayaking around part of the Falkland Islands in spring 2017 to raise awareness of PTSD and to raise money for armed forces charities. The main aim of the Cockleshell Endeavour project has always been to raise awareness of PTSD amongst servicemen and women and veterans. One half of the Cockleshell team, Steve has finally come to terms with the fact that over a number of years he has increasingly been affected by the symptoms of PTSD, a situation he feels may be relate back to his experiences both in the Falkland war and tours of Northern Ireland. He is currently undergoing full diagnosis and treatment for this condition. Since he has been involved in the Cockleshell Endeavour project he has noticed a significant improvement in his symptoms and believes this is down to the training and events he has been participating in. It is for this reason that today we are incredibly proud to announce that the Cockleshell Endeavour has evolved further and, as well as Mick and Steve’s Falkland’s kayak, the project will now be supporting other recovering service personnel and veterans though a number of kayaking projects. 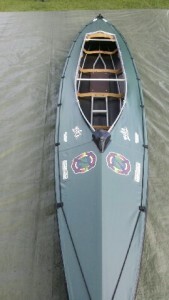 The first of these projects is the Devizes to Westminster Race 2017 where the Cockleshell Endeavour project will be entering five pairs, one half of which must be a serving military personnel or veteran who is recovering from serious injury or physical or mental health issues, including PTSD. 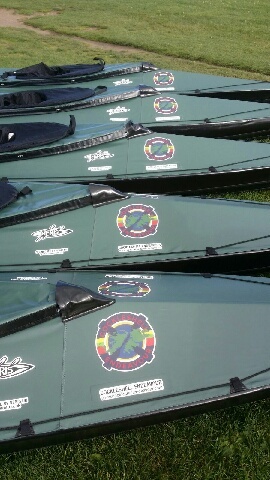 This part of the Cockleshell Endeavour project would not be possible if it were not for the support that we have received, such as the incredibly generous donation of five two-man Neris Valkari 2 kayaks by Simon Bolze. These kayaks, which Simon has branded with the Cockleshell Endeavour logo, can be folded down which makes them ideal for transporting to events such as the Devizes to Westminster. Over the next few weeks we will be telling you more about the kayaks that Simon has donated, but for now a massive thank you to Simon. We also need to say a big thanks to Paul Rigby – Riggs – who has supported the Cockleshell Endeavour from the start, and this weekend delivered kayaks to two of the teams that will be using them for the Devizes to Westminster race, one in Cirencester and one in Swansea. Next weekend he will be dropping a third off to Air Defence Troop in Plymouth, ensuring that another team can be part of the Cockleshell Endeavour project. Thanks Riggs. Over the next few weeks we will be updating you further with news of the teams participating in the Devizes to Westminster Race and the charity they will be helping to raise funds for – The Royal Marines Charity. The Devizes to Westminster International Canoe Race starts in Devizes, Wiltshire, finishing just downstream of Westminster Bridge in central London, opposite the Houses of Parliament. The race has been held annually over the Easter Weekend since 1948. It’s a gruelling challenge which will see the teams kayak 125 miles, with 77 portages. It is expected to take them over 30 hours to complete, finishing in Westminster on Easter Sunday Evening. The first 52 miles are along the Kennet and Avon Canal to Reading, the next 55 miles are on the River Thames to Teddington. The final 17 mile section is on the tidal portion of the Thames. The Devizes to Westminster is described by the organisers as a severe test of skill, physical and mental stamina and planning which produces a memorable sense of achievement for those successfully completing it.